Nokia is reportedly bringing its Lumia 800 Windows Phone to China next month. The sources have told WMPowerUser that the Windows Phone 7 device is ready to become available on China Telecom’s network. The device has already been spotted in imaged in China, forcing us to believe that reports are true. It seems that both Microsoft and Nokia are busy testing their Windows Phone 7 device running the Tango operating system in the region. Images of the handset device appeared on the Chinese microblogging site Sina Weibo shows that the device is being tested with the country’s third largest operator. However, we have no clue about its pricing plan and other details related to its launch as we have not yet heard any official words on Lumia 800’s China launch. Being one of the stronger brands in China, this move from Nokia is an aggressive one together with China Telecom. The introduction of Lumia 800 in the Chinese smartphone market would be a healthy addition which will soon be joined by Apple’s iPhone. 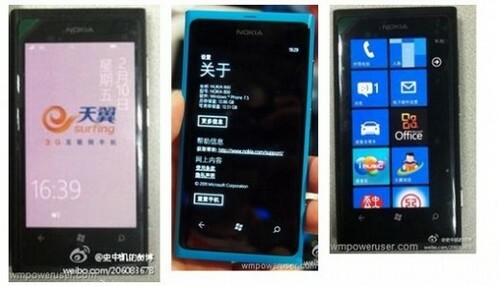 In addition to Lumia 800, some sources also predict that Lumia 900 is also being lined up for launch in China and it will be there for launch one month later in April after Lumia 800’s release. It is still to be seen whether Nokia will bring its lower-budget Lumia range and Asha series in the country. Nokia has speculated the importance of the potential of Chinese market and for this reason it has also relocated its Asia Pacific head from Singapore to Beijing. Also, Nokia has recently decided to move its production units to Asia with a job cut in Europe and Mexico.